The season’s strangest gift book has to be Babylon: Surreal Babies, a set of postcards from the collection of the British art dealer James Birch. The poet Paul Eluard, like many of the Surrealists an avid collector of postcards, described these ephemeral visual greetings as a “Lilliputian hallucination of the world.” The phrase is especially apt here. The baby postcards are subtly disquieting images. They were produced between roughly 1900 and 1920, a period that saw postal services throughout Europe all but overwhelmed by the craze for sending vast quantities of every kind of picture postcard. In their day, for most senders and recipients, the babies presumably represented a sentimental celebration of fertility and the natural joys of parenthood. 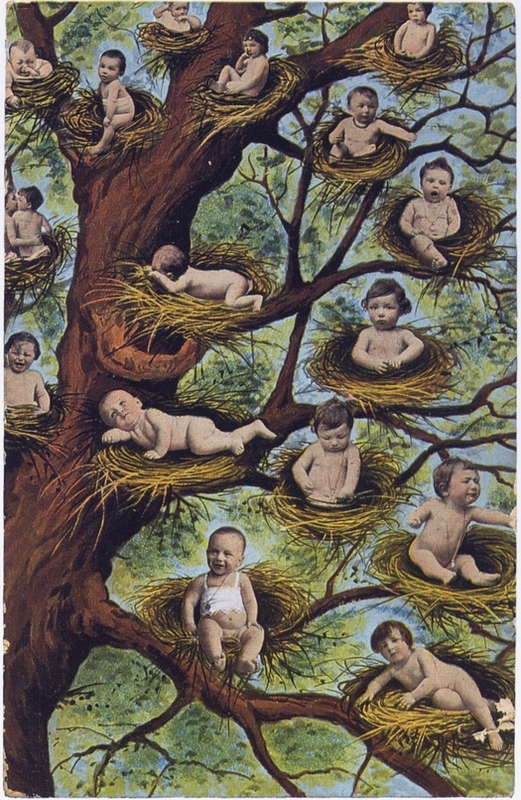 The exuberant nippers break out of egg shells, sprout like chubby pink vegetables in the cabbage patch, and luxuriate in their nests in the trees. 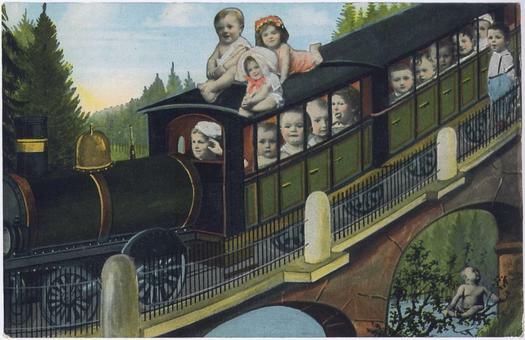 An unstoppable army of bonny babies engage, like their parents, in the genteel leisure pursuits of the era, swimming, cycling, going for trips on the steam train, and sailing around in pleasure boats. The capacity of postcards to express the collective unconscious by revealing unacknowledged motives and staunchly repressed desires fascinated the Surrealists. Salvador Dalí, another collector, described postcards as “the most lively document of popular modern thought, a thought so profound or so sharp that it eludes psychoanalysis,” though he probably had something racier in mind. (See Oui: The Paranoid-Critical Revolution.) Surrealism and everyday visual culture were intimately conjoined and many of the Babylon cards are close in structure and atmosphere to the figurative branch of Surrealist painting. The pictures employ bizarre juxtapositions, curious dislocations of scale and have an air of mystery and dream. Impossible events are rendered deadpan, a single visual idea becomes uncanny through obsessive repetition, and the frequently awkward marriage of collaged photographs and painted backgrounds adds to the mood of peculiarity. In Paris and the Surrealists, a wonderful account of his own amour fou with Surrealism, the late British writer and jazz singer George Melly recalls a 1952 visit to André Breton, Surrealism’s founder, at his apartment in Paris. 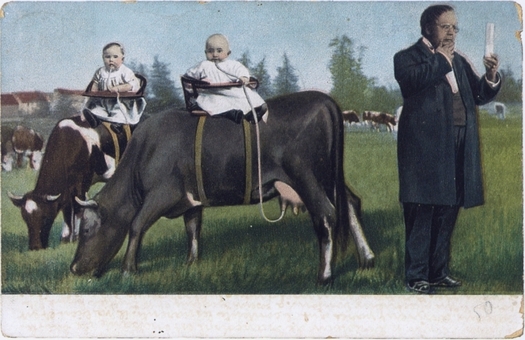 As a gift, Melly took a postcard showing four babies drinking milk straight from a goat’s teats by a system of tubes. 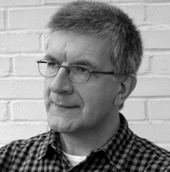 He repeats the story, with a few embellishments, in his introduction to Babylon, where a copy of the same postcard can be seen. Breton studies the card for a long time with barely a word, presumably because, as a collector himself, he was already highly familiar with such images, though too polite to disappoint his young admirer by saying so. There is also, it must be said, something deeply uncomfortable about some of these images revisited today — if only because we know better now (or at least acknowledge more publicly) how they might be misused by some. The postcard tableaux of older children in Babylon are not so far removed from Henry Darger’s psychosexual narratives of the Vivian Girls. One senses, too, in these uneasy visions of magically replicating infants, a latent feeling of threat, a fear of lurking malevolence in the young that sometimes finds an outlet now in horror films such as The Children (2009) where homicidal tots driven mad by a virus turn vengefully on their progenitors. These made me think of Anne Geddes' photos. I agree that "There is also...something deeply uncomfortable about some of these images..."
I have a very rare set of postcards published by the Surrealist Group in England in 1940, edited by E.L.T. MESENS "A Dozen Surrealist Postcards" - they are in their original envelope. I believe very few of these sets exist - where they were originally housed in the London Gallery in Cork Street, the building was bombed in 1940 and most of them were destroyed. Does anyone know anything about them?